Godswill Paper Machinery Co., Ltd. research and development department has been using 3D software - solidwork to build CAD, CAE and CAM systems since 1996. The computerized management offers efficient manage of manufacture- processes. 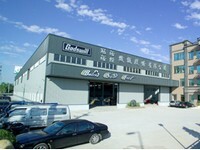 We provide the specific information about the in-house standard-parts to offer the best after-sales service. That cause we can manufacture perfect product to satisfy requiring of market. Satisfies its customers with quality, security, and service. We take serious for comments that come from user. This innovative mentality has allowed us to develop new products and to demonstrate our skills in complementary technologies like mechanics, hydraulics, automatic mechanisms etc. Therefore, if you have any question about our product, you can tell us. We will give you early reply. Furthermore, we look forward to searching a good business partner. If you are interested in our recycling equipment or you want to enquiry, please feel free to contact with us or you can email to us. We specialize in a variety of recycling machine, including twin head semi automatic stitcher, semi automatic gluer, automatic baling press professional recycle equipment, shredder equipment, prefeeder automatic stitching, box making machine, baling equipment, industrial paper shredder, paper recycling machine, cardboard baler, horizontal baler, cardboard cutting equipment, cardboard machine shred, board box corrugated machine, waste compactor, cardboard compactor.